The A-Team was not generally expected to become a hit, although Stephen J. Cannell has said that George Peppard suggested it would be a huge hit "before we ever turned on a camera". The show became very popular; the first regular episode, which aired after Super Bowl XVII on January 30, 1983, reached 26.4% of the television audience, placing fourth in the top 10 Nielsen-rated shows. 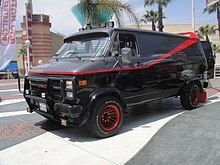 The A-Team was portrayed as acting on the side of good and helping the oppressed.